The 2.5-liter engine from EJ series appeared in 1995. EJ25 is the biggest engine among other EJ engines - EJ15, EJ16, EJ18, EJ20, and EJ22. The engine became widespread in all major models of the brand. This engine uses the similar EJ20 cylinder block which differs by the bigger bore (99.5 mm) and stroke (79 mm instead 75 mm). Connecting rods length is the same, but the compression height of pistons is shorter by 2 mm (30.7 mm instead 32.7 mm). These changes give 2.5-liter displacement in the result. The first generation of EJ25, EJ25D engine, has the DOHC aluminum cylinder heads with four valves per cylinder. Camshafts are driven by timing belt as well as each EJ motor. The power of EJ20D is 155hp at 5600rpm, but from 1997 it got new pistons, and its power output rose up to 165hp. This motor was replaced in 1998 by the more modern EJ251 engine. EJ251 motor has SOHC heads, new pistons and higher compression ratio (10.1:1). The EJ252 engine was built for California State especially; it has another intake manifold and throttle valve for reducing emissions. The EJ253 is another version of the EJ25 which appeared in 1999. 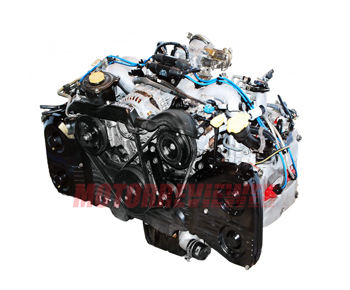 This engine is equipped with MAF-sensor and Tumble Generator Valves in the intake manifold. From 2006, this engine was fitted with the i-AVLS system, which changing the intake valve rising. The EJ253 was tuned again in 2009 - light pistons and headers, plastic intake manifold and new plugs. The EJ254 continued the history of EJ25D from 1998. It has DOHC cylinders heads also and AVCS system on the intake camshafts. The naturally aspirated 2.5-liter engine began replacing new FB25 motors from 2011. The EJ255 is a turbocharged version released in 2004 as the engine for the Forester. 2005-2006 Impreza WRX and Legacy models also were equipped with the EJ255. Thу first generation of EJ255 has open deck short block, and DOHC heads AB650s with variable valve timing system AVCS on the intake camshafts. The compression ratio is 8.4 (2004-2006 STI engine has 8.2:1 compression ratio). The engine has TD04L turbocharger produced 0.8 bars. The output of this configuration is 210 hp at 5600 rpm. The second generation of the EJ255 is used in the 2006-2008 WRX, the 2007+ Legacy, and the 2006+ Forester. It uses a slightly different cylinder block and cylinder heads. JDM Forester STI used VF41 turbocharger, WRX III - VF52 (0.92 bars). The Legacy GT up to 2009 used VH46 (0.96 bars, 250 hp at 6000 rpm). After 2009, the Legacy GT engine uses VH46 turbocharger produced 0.82 bars and 265 hp. The EJ257 is one more Turbo version specially designed for WRX STI. The engine had DOCH cylinder heads, 16 valves and based on semi-closed cylinder block (2004-2006 EJ257 shared the same EJ255 block). The engine equipped with AVCS system on the intake camshafts, turbocharger IHI VF48 (1 bar), DBW, and pistons for compression ratio 8.0:1. The output is 280 hp at 5600 rpm. STI model in the USA used IHI VF39 turbocharger, and the power is different, 04-07 models - 293 hp and for 08-16 is 305 hp. WRX STI III EJ257 engine has 8.2:1 compression ratio, AVCS on the intake and exhaust camshafts. The power of this engine is up to 300 hp at 6000 rpm, and torque is 300 ft-lb (407 Nm) at 4000 rpm. The EJ25 2.5-liter engine has the same two-liter engine problems. You can read about them here.